I’m often asked about how I teach really young puppies how to go to the bathroom outside. I start the process around three weeks old, and by the time they go to their new homes at around 8-9 weeks old, they are pretty solidly trained, and only need to learn where to go, not how or why. It makes having a new puppy so much more fun. I get to enjoy a month of puppies to play with inside my house, without ruining carpets and floors. The puppies love it, because the process involves some climbing and fun, exploring new territories while always being able to retreat to the safe den, their whelping box. The physical set up is a bit tricky, but I’ve now been able to get it to work in three different locations. So the key is getting a whelping box to fit next to a door or window that leads out onto a secure and safe outdoor area. 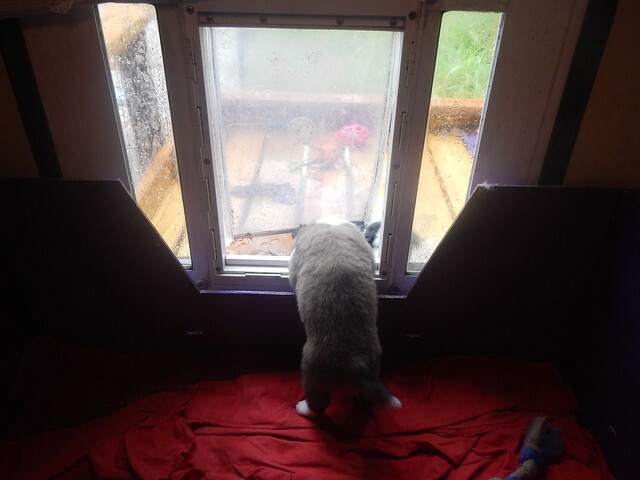 We’ve used a balcony with a sliding door, and twice we’ve built a temporary platform out of milk crates next to a living room window, and then constructed a deck outside that window. They’ve been a little rough around the ages, but they’ve held up to five litters now, and each time we learn something that helps the next time. We use a long ramp lined with chicken wire instead of stairs. But we have several areas with steps in their yard that they play on, hide under and climb on for fun long before they need to use them properly. They quickly run up and down the ramp at high speeds, getting used to heights in the process, the little fearless monsters. 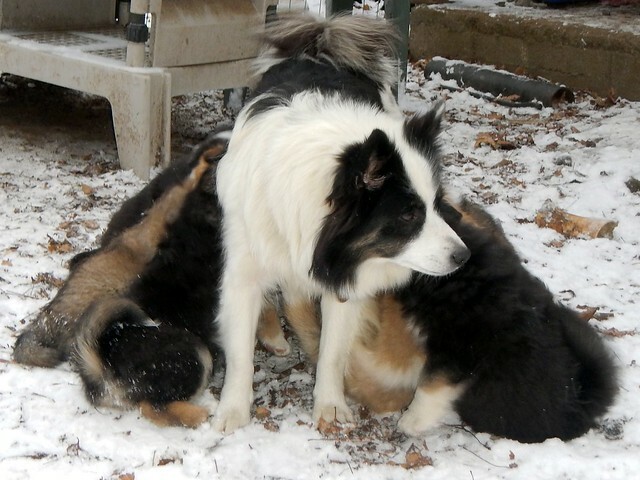 As soon as the puppies become the slightest bit mobile, they’ll wiggle away from the puppy pile to piddle. When they start to drag themselves around, they’ll usually all pick a particular section of the whelping box. When they can really walk, I’ll place them through the flap of the window box, and place them outside on the deck for just a few short minutes. I’ve gotten pretty good at that timing. They’ll sniff around a bit, start to explore, piddle and then I put them back into the whelping box, where they fall asleep pretty quickly. Wash, rinse, repeat. Within a few days, they are starting to play around the window and poke their head through. When the mom starts to nurse them while she is standing up, she’ll stop feeding them before they are quite ready, while they are all still sucking and attached to her, and she’ll go out onto the deck. They will eagerly try to chase her out there — hey! we’re not finished yet! I help them wiggle out there and she’ll let them finish nursing for a bit. She’ll leave them there where they will explore out there for a while with nice full tummies. They’ll poop within a few minutes, which I clean up if the mom doesn’t. In a few minutes more, they want to go to sleep and get whiny, so I help them back in through the window to their safe and familiar whelping box, where they snuggle together in another puppy pile. At about a month, I introduce some solid food. I use a raw diet of whatever we are farming at the time, with plenty of organ meats and healthy fats, and raw milk to drink. I put the food, water and milk outside on the deck. I let the mother clean up after them. She needs all the calories I can get into her! 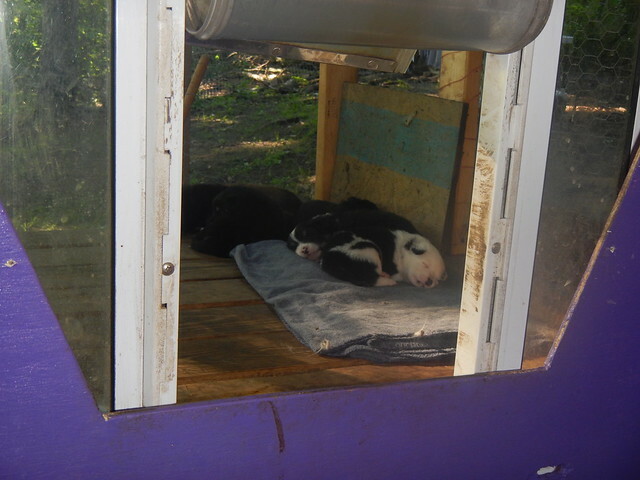 Before long, the whelping box is used mainly for sleeping, some playing, but all the fun stuff is happening outside. Food, toys, water. Things to climb on, new places to explore. Fewer and fewer accidents happen in the whelping box, which is less laundry for us, finally. They also often voluntarily sleep outside, no matter what the weather is like. I’ve found very young puppies sound asleep on the little deck covered in snow, even. Goofballs. I soon start to allow them in the living room, right after I know everyone has just gone to the bathroom. I make sure everyone knows how to get back outside, so we play right next to the door. I hang a ribbon of bells on the door knob so that everyone who goes in or out of the door makes it jingle.